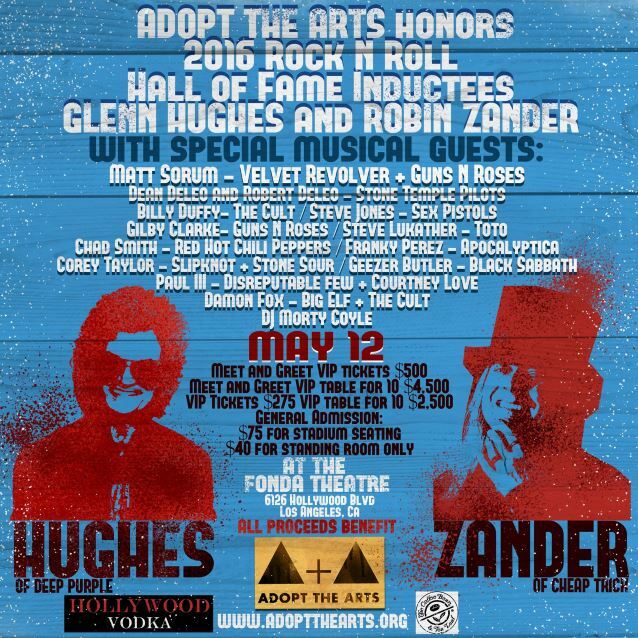 2016 Rock And Roll Hall Of Fame inductees Glenn Hughes (DEEP PURPLE, BLACK SABBATH) and Robin Zander (CHEAP TRICK) will be honored by Adopt The Arts on Thursday, May 12 at the Fonda Theatre in Los Angeles, California. Tickets go on sale April 1 at 10:00 a.m. PT via AXS.com. Adopt The Arts is raising awareness and money to keep arts education in public schools in Los Angeles, and is gradually expanding into other cities. As in many school districts around the country, year after year LAUSD has been slowly eroding its commitment to arts education by reducing its arts education budget incrementally. According to its own numbers, LAUSD estimates that only 50% of elementary school students are getting some kind of art instruction at school. Some estimates suggest that LAUSD spends just 3 cents per child on arts education even though all scientific studies show that an education rich in the arts enhances academic performance, improves school culture, mitigates truancy and tardiness, and is instrumental in fully developing the young mind. Adopt The Arts is focused on developing strategic relationships with educators, administrators, and board members to ensure that they are identifying the most underserved schools in the district. Each school site is "adopted" by a working artist, celebrity, or public figure. And while monetary donations are essential to Adopt The Arts' mission, personal involvement on the part of successful actors, musicians, artists and entrepreneurs is vital to the success of its program. Too many children are in great need of being exposed to inspirational people who have worked hard for their successes. The interaction between the children and adoptee creates a sense of responsibility and shared commitment from all involved. Says Sorum: "This isn't just about your kid who may or may not be in public school; this is about our community. A lot of entertainers and wealthy people in the entertainment industry don't know what is happening in America's public schools. Adopt The Arts is shedding light on the reality of public education and providing an opportunity for people to invest in their community."